Snorkeling is one of the most relaxing and easiest activities to share with the whole family. This is an unusual snorkel because the whole tour is spent with professional guides who will take you to several sites. This is a primary activity and is not diluted with scuba divers or alcoholic beverages interfering with the true activity. Each snorkel stop takes advantage of the multiple and diverse underwater sites. The first stop will be a reef stop. Second stop will be a reef or a wreck. These two sites will be selected based on conditions that day. We'll find the clearest and calmest of locations with the most marine life. 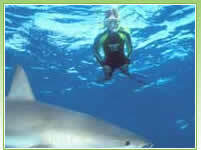 The third snorkel stop will bring you close to the Caribbean Reef Sharks. It's not as scary as it sounds. You'll snorkel at the surface with the guide as the sharks swim calmly at the ocean floor, or if you prefer, observe these magnificent creatures from the boat. Unlike most of our trips, this one may have lots of dedicated snorkelers together. But you will love the location, and you will truly enjoy the reefs around you. Mon-Sun, Departure Times: 12:00 PM (5 hrs) Trip length includes 1 hour transfer time each way. Bring a towel, sunblock and a dry T-shirt. All snorkel equipment, including a flotation vest and fins, are supplied. Transfers from the cruise ship pier are included. Children under age 5 are not allowed on the boat.